Kairos Palestine is the "Letter from a Birmingham Jail" of our time. This Confession of Faith, written in 2009 by a broad spectrum of Palestinian Christian leaders, is addressed to Palestinians, Israelis, the international community--as well as all the churches of the world. It lifts up the classical theological virtues of faith, hope, and love that lie at the heart of the Christian Gospel, and affirms that resistance to injustice and oppression is firmly grounded in these principles. It is both an anguished cry in a dark hour and a profound testament to unquenchable hope. The study plan includes informative background material on the Israel-Palestine conflict including three maps in color. 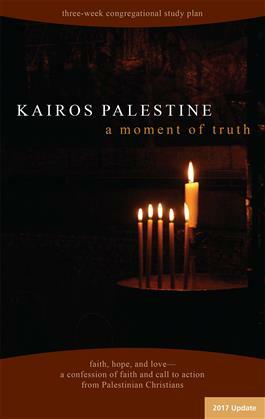 This material provides essential historical, political, and theological context for the Kairos Palestine statement. The booklet is an excellent guide for readers undertaking an individual study of the document. Church-based groups will benefit from the detailed lesson plans for a three-week congregational study, including a list of thought-provoking questions to stimulate reflection and discussion. This study guide is produced by the Israel/Palestine Mission Network (theIPMN.org), a grassroots organization of the Presbyterian Church (U.S.A.) established in 2004 with a mandate from the denomination's General Assembly for the purpose of encouraging wider and deeper Presbyterian involvement with Palestinian Christians and advocating for the human rights of Palestinians under military occupation. As part of its mandate, the IPMN speaks to the church not for the church.